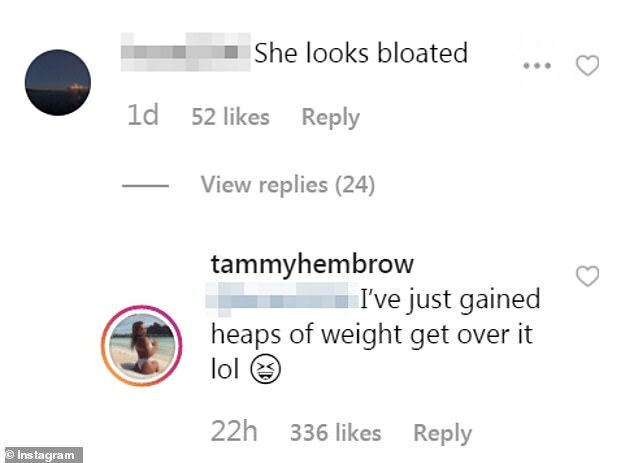 ‘She looks bloated’, the troll commented below two photos of Tammy posing outside the VIP event. Rather than ignoring the hurtful remark, the Saski Collection founder responded: ‘I’ve just gained heaps of weight get over it lol’. It’s possible Tammy hasn’t been exercising as much lately after she injured her ankle. A video recently emerged on an Instagram fan account in which a friend of Tammy’s could be heard saying she has a ‘broken’ ankle. ‘Tammy’s literally got a broken ankle, so she’s going to Coachella on crutches,’ the female friend said off-camera. While Gold Coast native was visible in the footage, she wasn’t using crutches. Nevertheless, she seemed to be in pain and limping from side to side.